Seamless Sailor, Julie Sandler Lambert, sent a note a few months ago with a great idea for a fun project that I couldn’t wait to make – a floaty seat using those toy swimming noodles. She wrote a post on her blog, S/V Second Star, with excellent instructions on how to make a noodle chair. Simple and easy to make. She suggested a guest post on Seamless Sailor, so I’ve added her post here. Thanks, Julie! In preparation for our upcoming weekend cruise I spent the day getting prepared. Did I plan out our provisions? Nope. Did I replace the secondary bilge pump so that we would have a backup? Not that either. Today the most important thing we needed to get ready was our floaty toys. I looked at all of the websites for our local big box stores to see what they had to offer. While there were a ton of chair style floats, most seemed like they wouldn’t last out the weekend, others were way too expensive so I decided to design my own. We had some leftover Sunbrella from a previous project, so I decided to start there. Next was the float, off to Walmart to grab the fattest noodles that I could find. Back home, with measuring tape in hand, I measured the diameter of the noodle, added seam allowances and sat on the tape to estimate just how big I wanted to seat to be so that we would float at the proper height in the water. I added all of these numbers together and came up with 70”, the theoretical perfect fabric length for our chairs. Below are my pictures of the construction. After a quick test I realized that the noodle doesn’t sit at the top of the water, which I would have realized ahead of time had I thought about our noodle use from last summer. That changed the dimension of the fabric for round two. 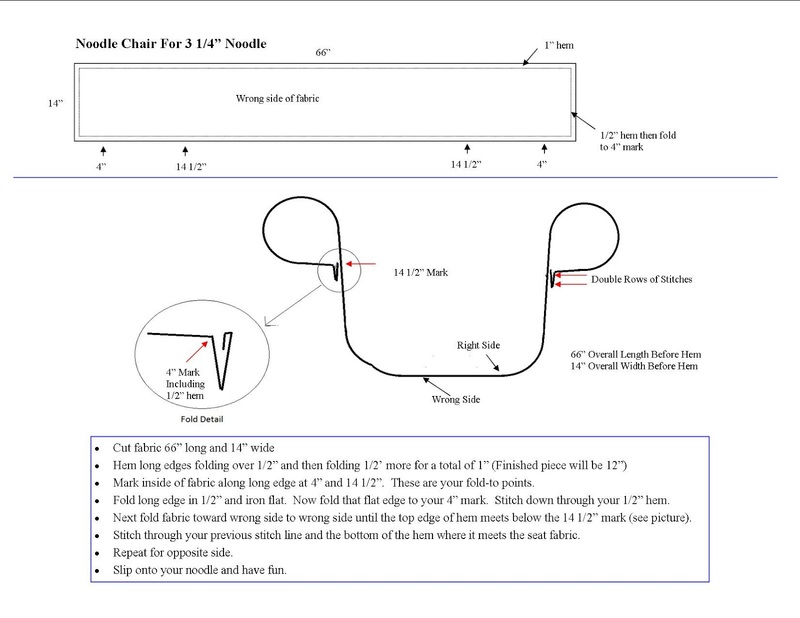 Below is the drawing and stitching guide for the finished chair. Ziggy modeling the finished chair! I used Julie’s pattern and made a wonderful noodle seat out of Phifertex. This is a great floaty toy that doesn’t take up much space and it dries quickly. It’s all about storage, right?! My husband decided he wanted two noodles as we have the smaller noodles ($2 each at Best Hardware). So no surprise noodle seat version 2.0 was devised with casings for two noodles. Easy, inexpensive and works great! Many thanks to Julie for her ingenuity coming up with the pattern and sharing it with Seamless Sailors! Have you created any swimming toys you want to share?